When we have a busy weekend scheduled, sometimes Date Night needs an easy date, something pure and simple. Tonight we visit a simple taqueria for some pure food. 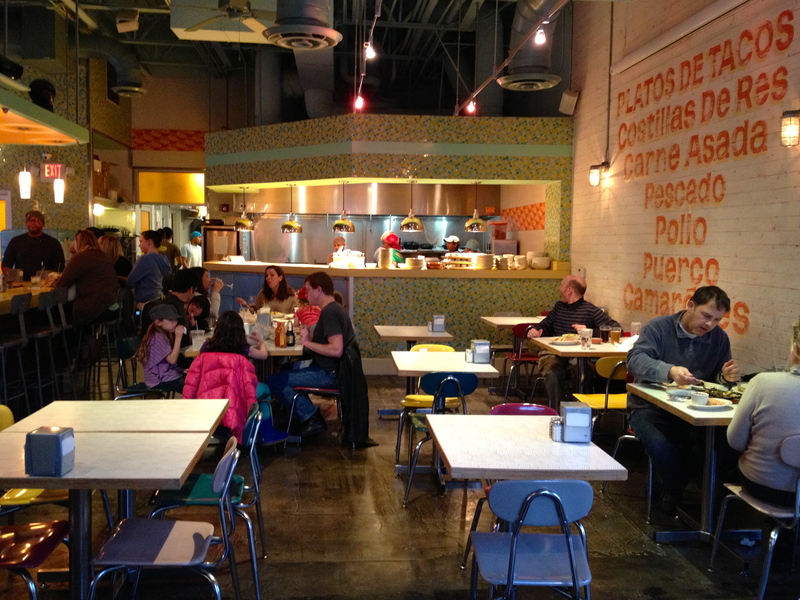 There are five Pure taquerias sprinkled throughout Atlanta. We are at the Inman Park location because it’s only 2.2 miles from where we work. You would think that it would be easy to get to, but downtown is packed with hairdressers and cheerleaders this weekend and the traffic is terrible. It takes us almost 30 minutes to navigate those 2+ miles. By the time we are seated, we are ready for some beer. 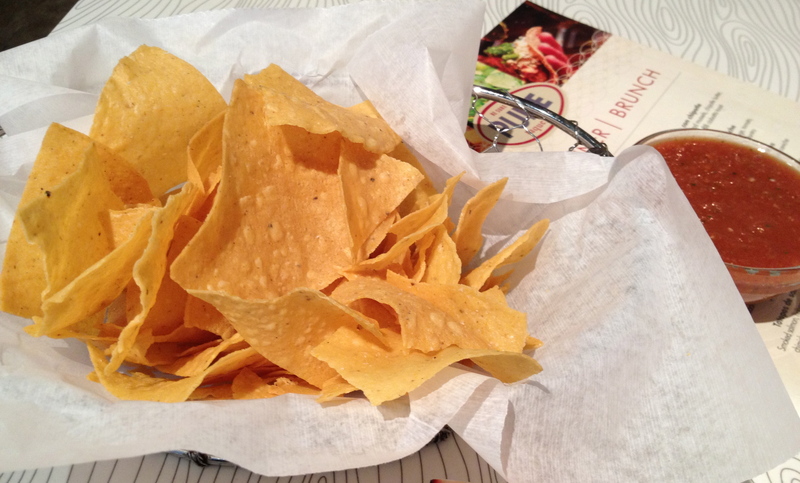 Before get to the beer, how about a nice basket of warm chips? These taste as if they just came out of the fryer. They are full of corn, so they must be good for you. Big open room with a big open kitchen. 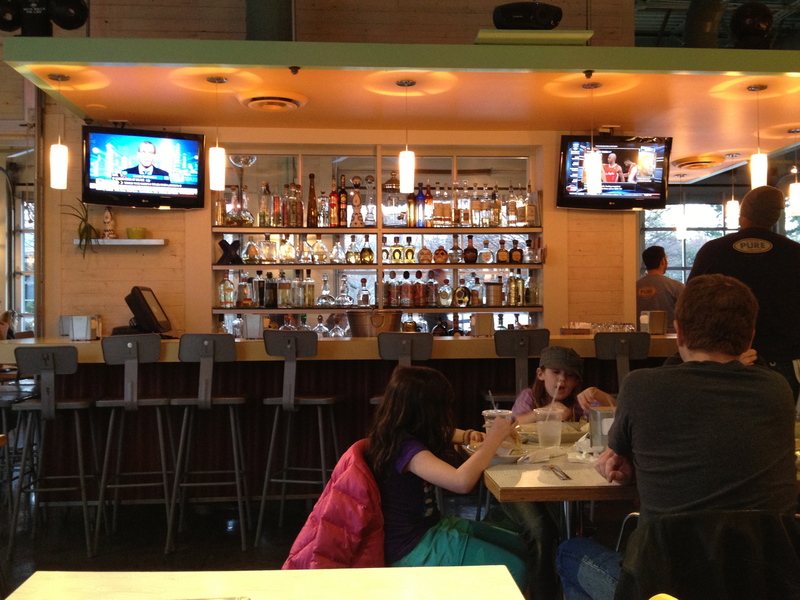 Pure has a centrally-located kitchen as well as a large bar. A large bar is the centerpiece of the room. We are here pretty early, so the party crowd is not out yet. There are a lot of children, who are surprisingly well-behaved. 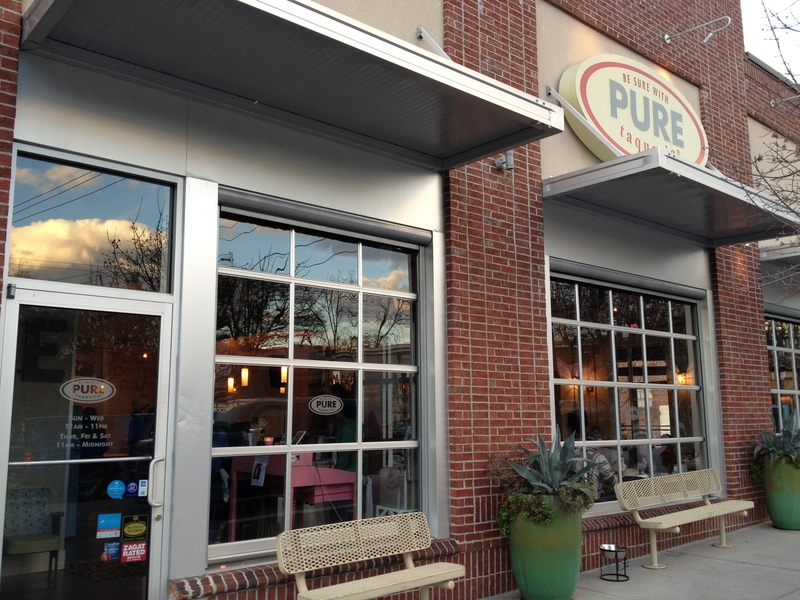 Pure has an outdoor area, and this place must be awesome in the spring. While you eat your chips, allow me to comment on the sorry state of beer menus in most Atlanta Mexican restaurants. As long as you like “convenience store” beers like Coors, Yuengling, Corona and Dos Equis, you are probably happy with these beers. Date Night has more sophisticated tastes, and unfortunately Pure (and its Mexican brethren all over the city) can’t really satisfy us. There is so much good beer available around here, yet we must endure menus that treat Bud Light Platinum as an exotic beer. They want us to drink margaritas, but we don’t really like margaritas (unlike Date Night fan RB who drinks them like water), so we are at a Mexican standoff. Negra Modela and a Neubourg from the Netherlands. There are two “special” beers on the menu tonight, Sweetwater and a Neubourg from the Netherlands. Our waiter, who needs to take a class or two in beer school, calls the Neubourg “some sort of Belgian beer.” We get out the iPhone to investigate and find out he’s not really close. The Neubourg isn’t bad if you like lagers. It tastes just like a Heineken, another beer that would be considered “exotic” here. All right, enough of the beer diatribe–let’s get back to our date! 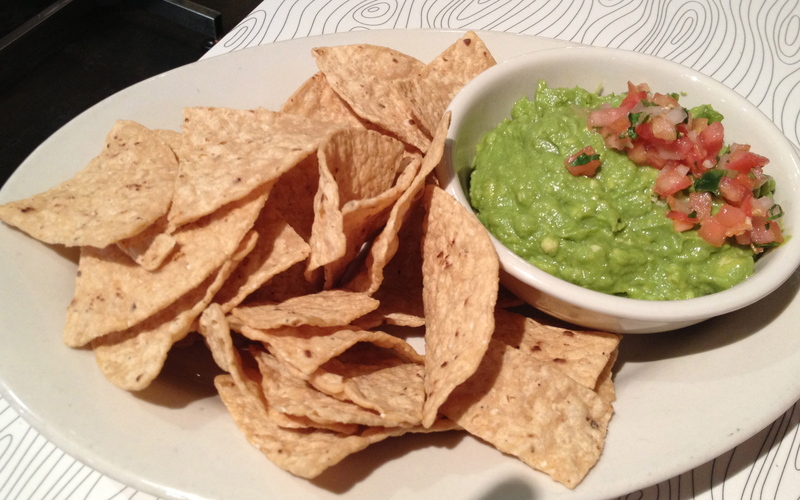 While you decide what’s for dinner, would you like some guacamole and chips? We order this for an appetizer and it is quite good. The avocados are delicious and we really like this dish. Notice that the chips are of a different consistency, and since these are also full of corn, we are eating even more healthy food. Who cares if it’s fried! We order dinner, each going for a different kind of taco. Oyster tacos. The daily special. Fish tacos. Wait…are these the oyster tacos? We do not realize it at the time, but we order almost the same thing. As you can see by the photos, they look pretty similar, but the taste is different. The oyster tacos are the special tonight, and since that’s something you don’t usually see on a menu, I give them a try. 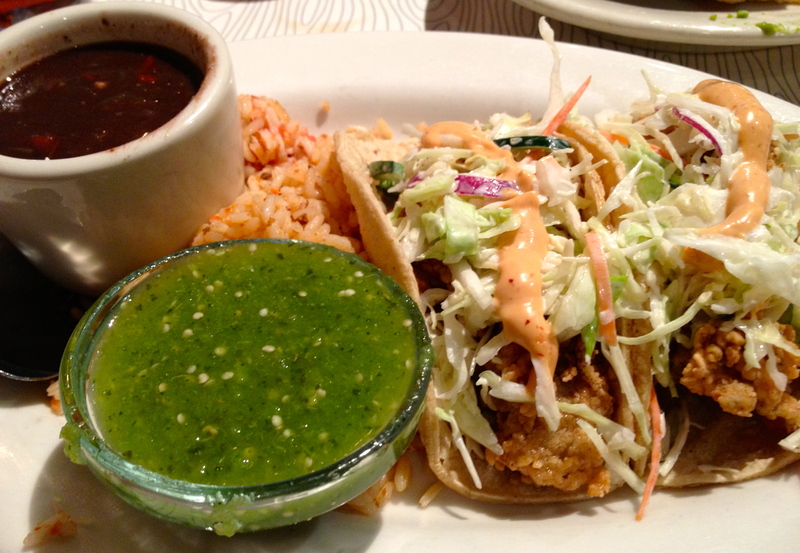 The fried oysters are excellent in the fresh, soft, corn tortilla. There’s that word again–fresh. The fish tacos taste almost the same, and just as “fresh”. Each has a crunchy shell around the moist seafood inside. 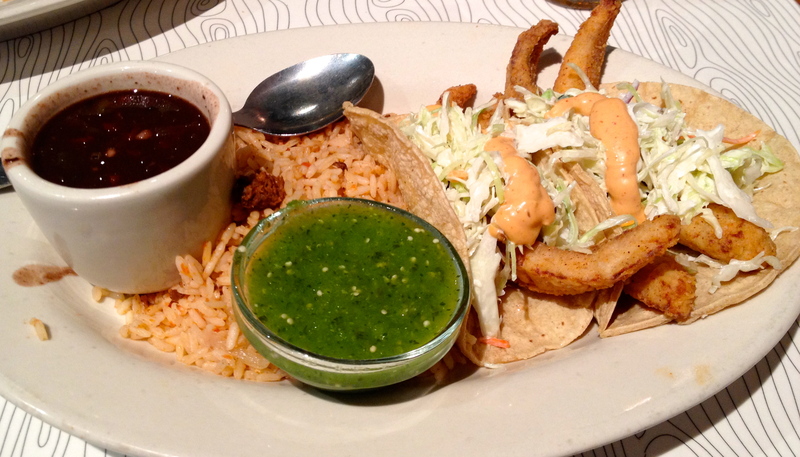 You get slaw and a side of rice along with a bowl of spicy beans with your tacos. It’s a good dish, and we both enjoy the food. Due to a plethora of Valentine’s Day desserts during the week, our waistlines demand that we skip dessert. 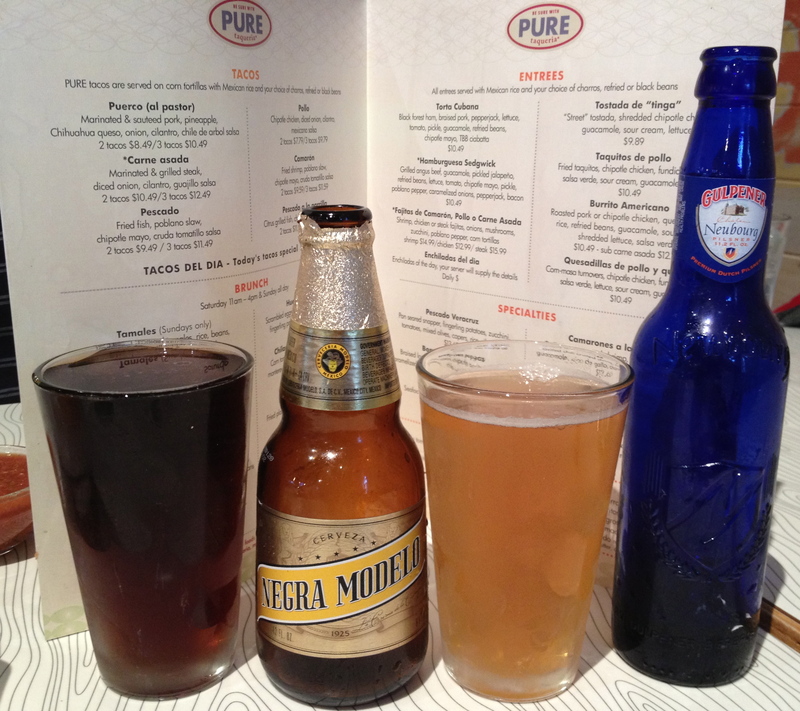 The bottom line on Pure: good, fresh food with a beer list that needs some “pure-ifcation”. If you can get around the beer thing, this food may bring you pure pleasure.